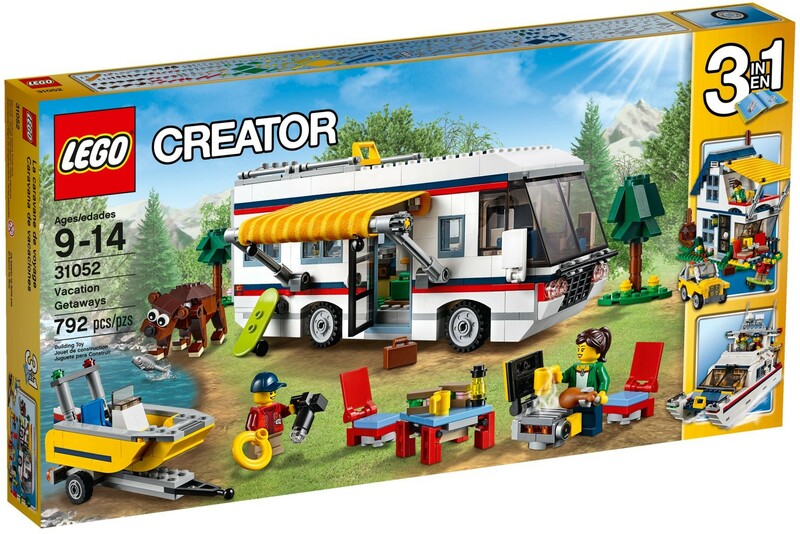 A lot of LEGO Creator sets come with brick built animals and 31052 Vacation Getaways is no exception. Today we will be having a closer look at the brick built bear included in this set. Also, we will share how to build a small cub to accompany him/her. there is a brick built bear, which is very posable. This model provides a lot of playable features. Suds on back. cartoony eyes expression. One of my favourite parts of the build is the bear. He looks like a rather friendly bear and has an interesting construction. There's a hinge piece in the middle of him that serves no purpose; I can only assume it's needed for the other two models. At first I thought he was rather small, but compared to a minifig he's a decent size. I love brick built animals, and I like the bear. But really, LEGO needs to make those ball joints in a colour other than grey, and I wish the bear had a mouth. Otherwise, how does he get to eat the fish that he's caught?